BUDAPEST – 14 September 2015 – Prologis, Inc., the global leader in industrial real estate, has held its second annual five-a-side football tournament at the Green Path recreational area of Prologis Park Budapest-Harbor in Hungary. 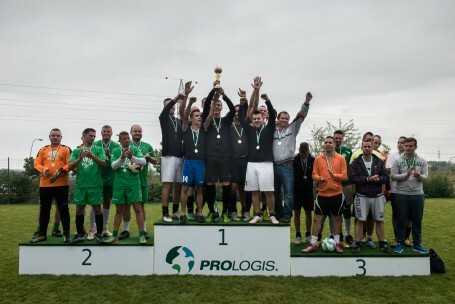 Of the 13 participating teams of Hungarian and regional customers of Prologis, Brendon won the second annual Prologis Budapest Football Games cup, which was held on Friday 11 September. NCR, last year’s champions, finished second and CooperVision came third. Prologis opened its recreational and sports area in Budapest three years ago as part of its commitment to environmental stewardship and customer relations. As well as the football field, the Green Path area includes a barbecue area for company events or other leisure activities, and community gardens available to the customers of the park. The recreational area is located at Prologis Park Budapest-Harbor, next to the sustainable wastewater treatment facility, which produces irrigation water for the whole park. Prologis Park Budapest-Harbor comprises eleven buildings, totalling more than 132,000 square metres of distribution space. The park is located in District 22, on the southern edge of Budapest, 12 kilometres south of the central business district, between the motorways N6 and M6 and only 2.5 kilometres from the M0 ring road with direct access to the airport.